I once bragged about making an Almond Poppy Seed Cake. Someone responded it was a novel idea, because lemons and poppy seeds are an overuse combination of flavors. 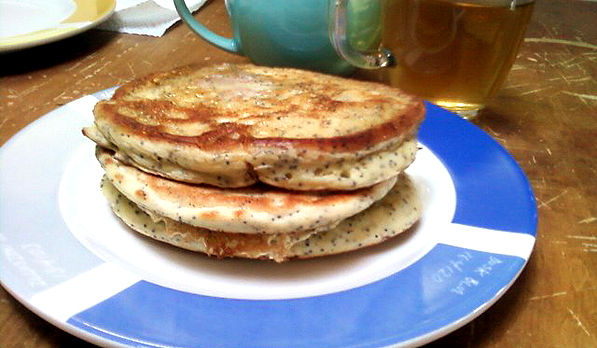 Does everyone automatically pair poppy seeds with lemons? The flavors might be boring to some people, but adding them to a familiar recipe, such as pancakes, is a scrumptious twist. I can’t help to notice how bright it taste especially when its paired with warm maple syrup and caramelize apples. The flavors are unimaginative, but it makes an old recipe taste new again.